Synopsis: Oscar-winner Meryl Streep stars in this delightful "music hall" version of Lewis Carrolls Alice In Wonderland and Through the Looking Glass. 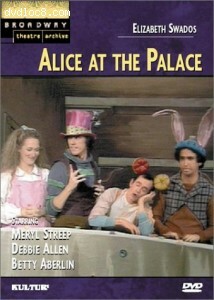 Also starring Emmy-winner Debbie Allen and Betty Aberlin, Alice at the Palace is an entertaining and shrewdly conceived retelling of Lewis Caroll classics with all the beloved characters-from the Mad Hatter and the Cheshire Cat to the Queen of Hearts-give a unique twist by the witty and charming performances of an accomplished theatrical ensemble. The play was adapted for television from Elizabeth Swados' New York Shakespeare Festival production entitled Alice in Concert, for which Obie-Award winner Swados also composed the score, adapted the book and directed for the stage.